Whether you're looking to improve your riding wardrobe or want to make off-season upgrades, make sure you understand the importance of safe riding gear. From a helmet approved by the Department of Transportation (DOT) to boots and pants made of thick material, motorcyclists should always wear the proper equipment when riding. 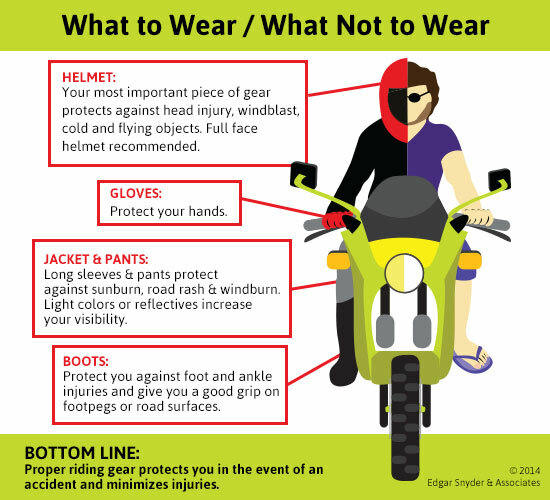 Wearing the proper riding gear can reduce your risk of a motorcycle accident and protect you from distractions like bugs, heat from your bike, debris on the road, and even weather. Statistics show wearing a DOT-approved helmet greatly increases your chance of survival in the event of a motorcycle accident. Your helmet should fit comfortably (never loose) and not impair your hearing or vision. High-quality helmets are made of fiberglass or a plastic blend, and they are lighter and absorb impact better than less expensive ones. 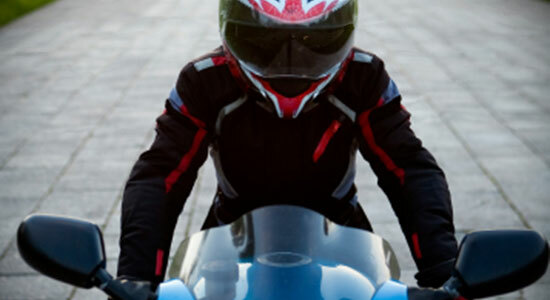 Along with wearing a helmet, motorcyclists should wear protective eyewear – either a helmet with a shield, a pair of goggles, or shatterproof glasses. Make sure your eye protection is clean and unscratched, and if your lenses are tinted for riding in the sun, have some that are clear for night riding. Remember, some states have helmet laws and require protective eyewear. It's also a good idea to wear disposable foam plugs or custom earplugs to protect your ears. You've probably seen riders with t-shirts, shorts, and maybe even flip-flops. But the truth is that you should protect your body as much as possible while riding. Doing so will keep raindrops from pelting you, prevent heat from the motorcycle scalding your legs, etc. Jackets should be made of sturdy material like denim, nylon, or leather – many have zippered vents that make them comfortable to wear year-round, even in warm weather. Pants should be made of thick material to resist abrasion. You should also wear gloves to prevent injury to your hands or fingers, which are crucial in maintaining control of your motorcycle. Always wear close-toed shoes. Boots are best, because they protect your ankles. Make sure you buy boots with rubber soles and good tread design so your feet don't slip. Even with headlights and tail lights, you should always wear gear that makes you clearly visible to other drivers. Wear brightly colored or reflective clothing, or you can put reflective strips on your helmet and the backs of your boots. It's always better to use extra caution and do everything in your power to make yourself visible to other motorists.